Designer's Best Picks: Mirror: Look. Shop. Reflect. Time for interior reflections - with mirrors. 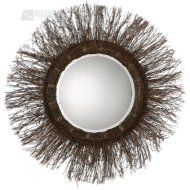 At our new online storefront, we're featuring a contemporary round mirror that brings nature and light into your space. This Gambir Contemporary Round mirror is priced to feature free shipping and can be delivered within a week. Do you feature mirrors in your space? Mirrors help a room look larger, brighter and crisper. By reflecting your room's own space, you create the illusion of expanded space and give the eye a bright spot to land. Take a look at our new storefront to see a myriad of mirrors with their dimensions, pricing, and estimated delivery. Look. Shop. Reflect.